Another key is a dedicated coverage model for each segment, one that clearly defines who interacts with the client for which needs at which times. Relationship manager (RM) client loadings, contact frequency, specialist involvement, and performance targets will differ depending on the type of client served. Digital channels play an increasingly important role in a well-designed coverage model, making interactions with the client both more efficient for the bank and more value-adding for the clients. Still, true front-office excellence is less about processes and setups than about changing the way the front office works on a day-to-day basis. The desired result is RMs who spend time with the right clients, proactively approach clients with appropriate investment ideas, minimize price discounting, and generate referrals in order to reach new prospects. 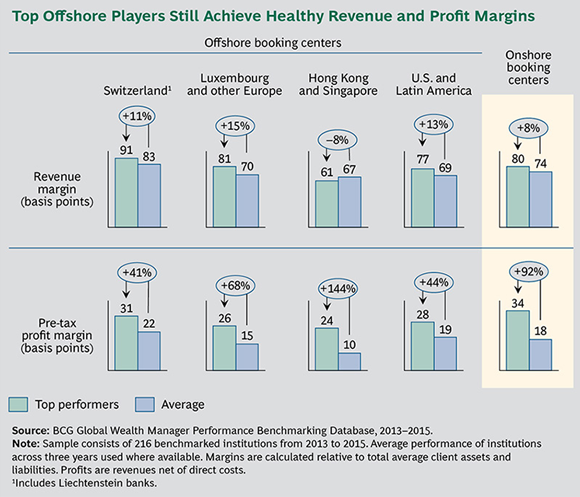 IS OFFSHORE WEALTH MANAGEMENT STILL AN ATTRACTIVE BUSINESS? Obviously, the days when high revenue margins were achievable regardless of a client’s domicile are a thing of the past. Offshore players must now deal with return on asset (ROA) results that can vary widely by market, reflecting local and regional investment preferences and behavior. But clients are still willing to pay a premium for benefits such as political and financial stability, regional diversification, high-quality service, discretion, and broad expertise across products and asset classes. When it comes to costs, offshore players have been hardest hit by tougher regulatory requirements, particularly in the know-your-customer category. Faced by the requirement for automatic exchange of information on client accounts across borders, they have had to regularize their client books and are subject to large fines for any negligence. Litigation in this area is likely to continue, and we expect the regulatory playing field to converge to rigorous standards in most parts of the world. In addition to investments in legal and compliance staff, significant technology expenses have been required to ensure compliance in all markets served by offshore wealth managers—making offshore banking a cost-heavy structure. It is therefore no surprise that average pre-tax profit margins in offshore booking centers are converging with those in onshore booking centers for many players. Ultimately, despite highly challenging developments in many areas of offshore wealth management, there is still potential for profits and future growth for those players that stay ahead of the curve.